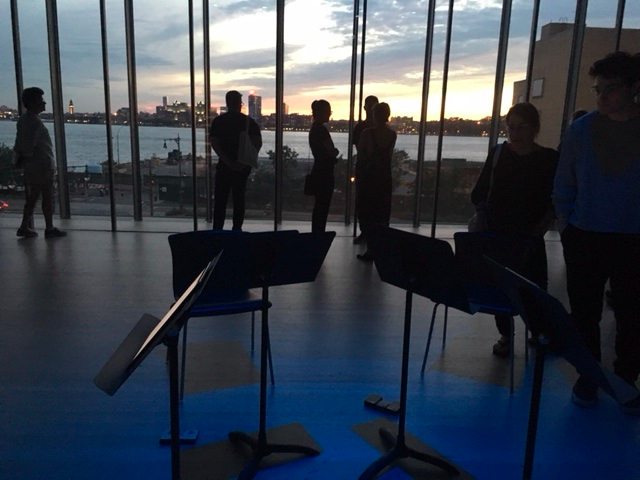 The quiet of a room where the JACK Quartet performs is crackling, even when the bowed notes are barely a whisper. The excitement comes not from dramatic bowing or whirling blown dry hair, but rather from a concentrated listening of the performers which gets mysteriously transmitted to the audience. The anticipation that fills the air is created note by note, sound by beaten sound. 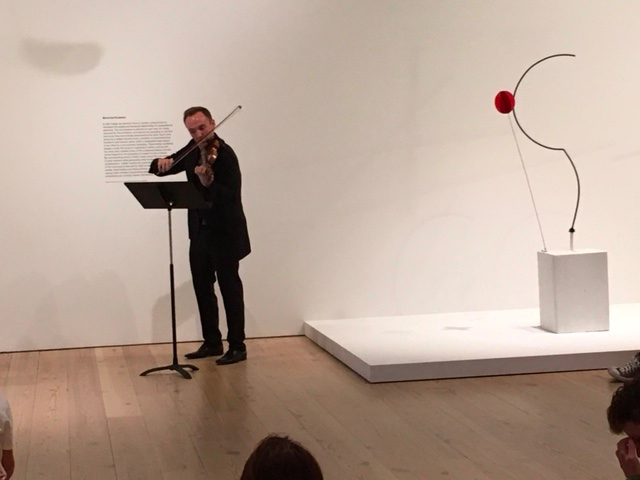 The American obsession with the visual is naturally served when appropriate music is performed in the midst of art. Like all great chamber performers, these instrumentalists talk back and forth to each other in sounds and notes. 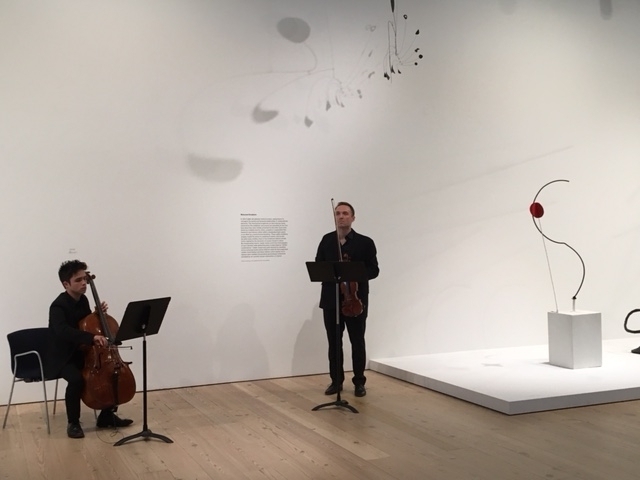 They are scattered across the eighth floor exhibit space at the Whitney Museum of American Art in which many Alexander Calder mobiles hang and stand. 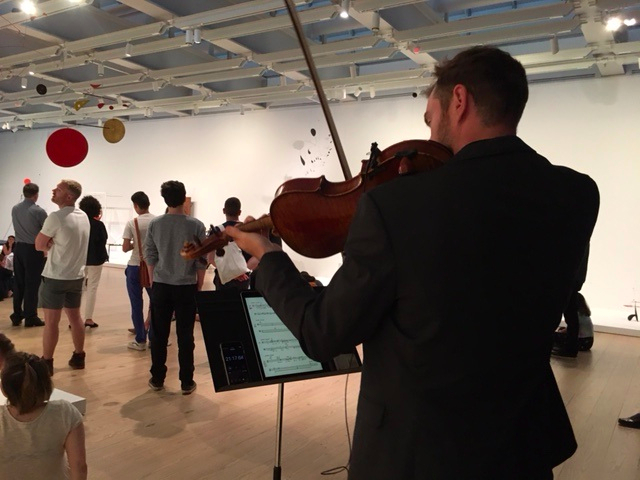 In the center of the room on the south wall, cellist Jay Campbell and violinist Austin Wulliman are conventionally placed with their music stands before them. 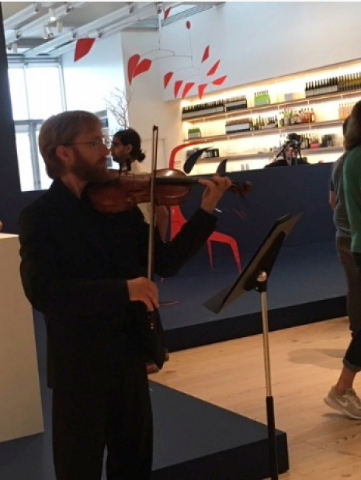 They do not seem to notice violinist Christopher Otto who stands at the east entrance, only a music stand dividing him from a roaming, and finally seated and standing still audience. At another entrance Jay Pickford Richards, violist, is in his own world, oblivious to in-your-face cameras, and the active audience. He is fixed on a digital timer, which brings the group together in time if not in space. The mood is set for a musical mobile. 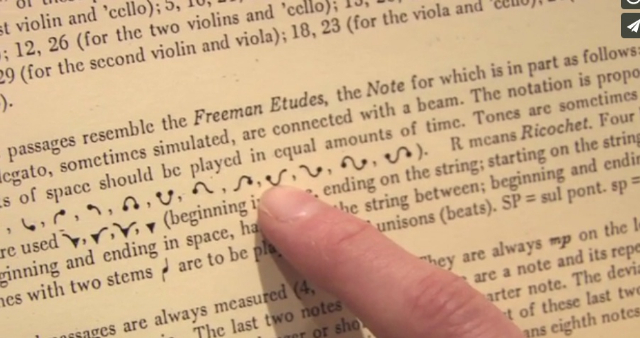 John Cage’s Thirty Pieces for String Quartet was written in time brackets. 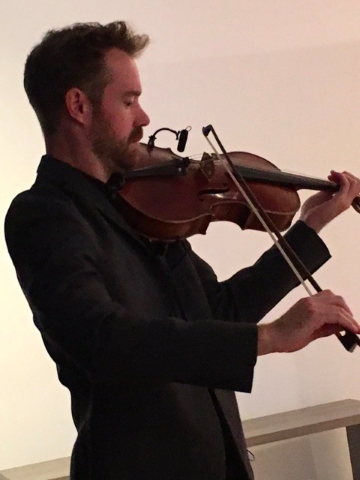 The first violin can enter any time in the first 45 seconds and exit after 30 to 65 seconds. The second unit can begin no earlier than 60 seconds into the piece. Already we see chance at work. We hear how irrational this music can become. It does, but in soft dynamics, and brackets composed of single notes or simple phrases. Calder and Cage were working at the same time and under the spell of many of the same thoughts. Beside Wulliman is a mobile that resembles a reversed question mark. Beside Campbell is a Calder work that suggests a juicy French kiss. For the audience, the sensation is one of many parts mixing. Yet the composer wrote that this is a piece for four soloists. Each performer has a choice of three textural possibilities. One is a pulse rhythm of tones and harmonics. Another is slower, more sustained lines and then there are complicated chromatic notes. This kaleidoscope of textures is mirrored in the mobiles variety of shapes and suggestions. Unpredictability of motion and sound suggestively collides in tone and shape. 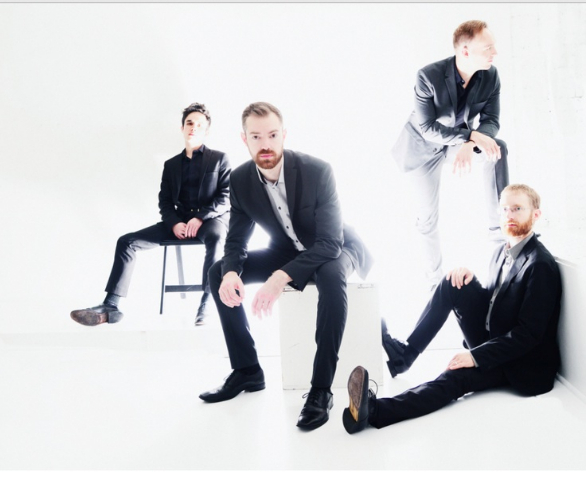 Each member of the JACK Quartet can draw forth sounds the excite and please. Often these are sounds you haven't heard before. We move down to Hess Theater for the second part of the program. Set in a more conventional concert theater, this continuation of the program features three composers. 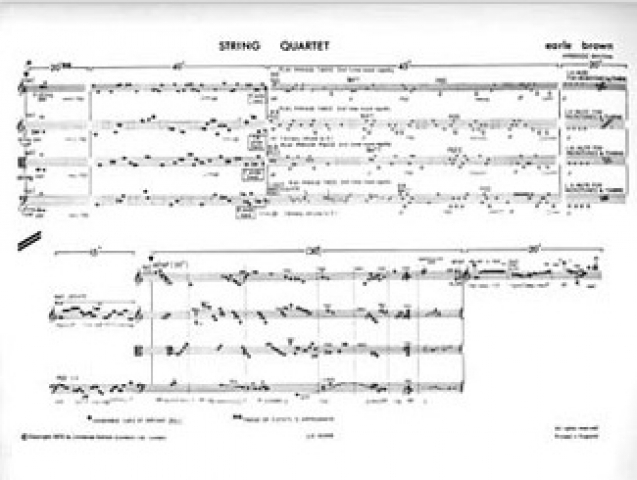 Morton Feldman’s Structures for String Quartet is as fully notated as any classical quartet. A one movement piece, it is performed very quietly, bridging the transition from the quiet Cage to the concert theater. Structures are spare and follow each other in linear patterns. The Quartet’s ease in often challenging passages makes for pleasurable listening. Massachusetts-born Earle Brown noted the visual artists Alexander Calder and Jackson Pollock as two of the primary influences on his work. 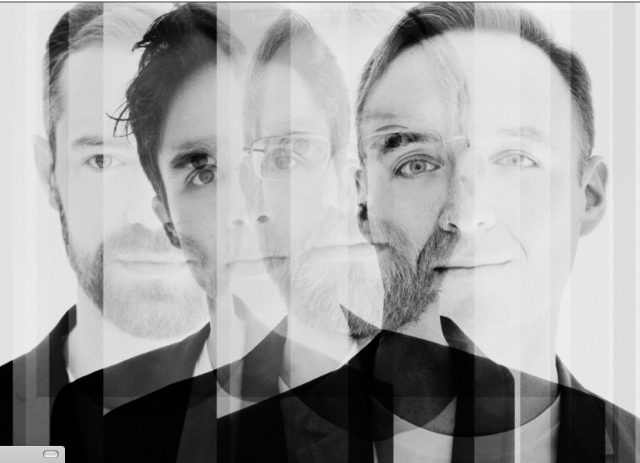 Brown wrote that his String Quartet is “composed material, open form.” Within the formal identity, what Brown called “performer process” spontaneity is clear in the JACK Quartet’s performance. In the darkened concert room a blue spotlight casts shadows on the wood of the instruments and creates beautiful blue silhouettes of the artists on the floor behind them. 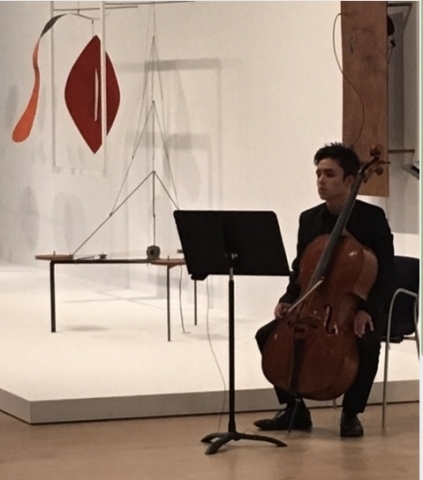 JACK achieves a lovely balance of collaboration between the composition and the performers, which is characteristic of both open-form and graphic works. Amy Williams' Richter Textures ended the program. Williams is an arresting composer, whose five movement work responded to the paintings of Gerhard Richter. Textures change from movement to movement. Clusters of tones sometimes hang heavy. They contrast with bows on the fingerboards. Pings and even chime-like tones are magically created in this roller coaster of texture. The audience in the Hess Theater was transfixed by the Quartet, who travel on to Chautauqua and then Lucerne. Watch for them next summer when they arrive at Tanglewood.